CINCINNATI, OHIO, Feb. 12, 2019 (GLOBE NEWSWIRE) -- IncludeHealth, an internationally awarded digital health & wellness company, announced its collaboration with HealthPartners Neuroscience Center in St. Paul, Minnesota. The primary partnership seeks to further advance clinical neuroscience research and the overall care provided to patients. HealthPartners Neuroscience Center, the largest free-standing neuroscience center in the Upper Midwest, is the first neuroscience facility to offer IncludeHealth’s breakthrough digital platform. The HealthPartners’ rehabilitation team is utilizing the platform in daily care delivery and developed a pilot ‘Muscle2Mind’ exercise program launching in early 2019. The goal of the ‘Muscle2Mind’ program is to assess the feasibility of patients with a diagnosis of Mild Cognitive Impairment or early Alzheimer’s disease, and the patients’ care partners to navigate a supervised exercise program. Phil Echert, a patient in the Muscle2Mind pilot program at HealthPartners, exercises with an IncludeHealth and the help of both his exercise physiologist Christa Lence and his caregiver Heather Echert. The 3-month Muscle2Mind program includes 5 pairs of participants, consisting of a patient with Mild Cognitive Impairment or early Alzheimer’s disease and their care partner. 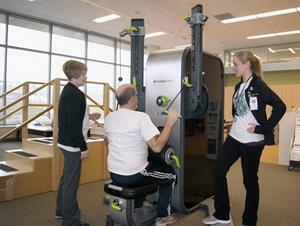 The pairs will utilize IncludeHealth’s equipment and technology under supervision of an exercise physiologist. The ability to capture data through IncludeHealth’s platform and assess feasibility of the program will guide the development of research protocols. A future research study goal will be to evaluate measurable outcomes to assess the effectiveness of the exercise program for patients with Alzheimer’s disease. “We are utilizing IncludeHealth’s technology in hopes of giving individuals with cognitive deficits more freedom and independence longer into their future,” said Marny Farrell, Director of Rehabilitation for Regions Hospital. “Creating an exercise protocol for this population will allow us to understand the impacts of exercise for patients with cognitive deficits,” said Amanda Herrmann, Neurorehabilitation Research Fellow at the HealthPartners Neuroscience Center. In early 2019, a video case study will be released about the partnership and collaboration between IncludeHealth and HealthPartners. IncludeHealth is a Cincinnati-based digital health & wellness company transforming physical medicine, rehabilitation & wellness. Offered through a monthly subscription, The Include Platform pairs HIPAA compliant cloud software with connected strength equipment to both digitize and inclusivize care. This unique pairing provides breakthrough capabilities such as outcomes-based data collection, automated documentation, cloud collaboration and equal access for all ages & abilities. IncludeHealth’s proprietary technology has been recognized with 29 international innovation & health awards and is utilized in orthopedics, neuroscience, pediatric care, senior care, government, and general wellness. To learn more, visit includehealth.com or connect via twitter (@includehealth) or Facebook (IncludeHealth, Inc.). Founded in 1957, HealthPartners is the largest consumer-governed, non-profit health care organization in the nation. The organization is dedicated to improving health and well-being in partnership with members, patients and the community, and provides a full-range of health care delivery and health plan services including insurance, administration and health and well-being programs. HealthPartners serves more than 1.8 million medical and dental health plan members nationwide. The care system includes more than 1,800 physicians, eight hospitals, 55 primary care clinics, 22 urgent care locations and numerous specialty practices in Minnesota and western Wisconsin. HealthPartners Clinic, Park Nicollet Clinic, Lakeview Health, Physicians Neck & Back Center, TRIA Orthopedic Center, Hutchinson Health and virtuwell.com are all part of HealthPartners. In addition, HealthPartners Dental Group has more than 75 dentists and 23 dental clinics. HealthPartners also provides medical education and conducts research through HealthPartners Institute. For more information, visit healthpartners.com. 5 SERITAGE GROWTH PROPERTIES : SERITAGE GROWTH PROPERTIES : Sears sues Lampert, claiming he looted assets and dr..